As a theme of this week has been youth, today I salute St. Dominic Savio. Here is a young man who was saintly at a very young age, proving the point that the virtues may be encouraged in children. So many parents cannot imagine saintly children, but as I wrote in an earlier post, families can be holy and can pass on holiness. The story of this sweet saint may be found here. 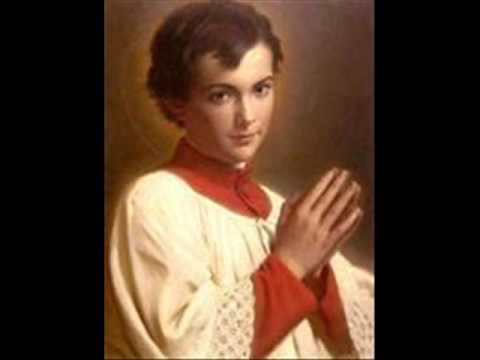 St. Dominic Savio, pray for us and all young people throughout the world today. 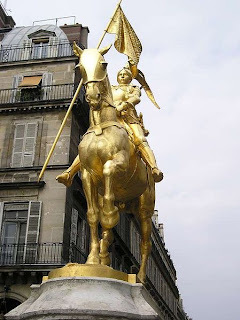 Today I am thinking of St. Joan of Arc. She is a young hero for today's youth. She is a role model for personal holiness and fidelity to one's conscience. She is an example of a young person who cooperated with grace, a particular grace for a particular time. 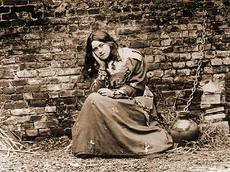 Her authenticity was based on Hope, the virtue of the soldier and the Church Militant. That she died by treachery is part of the same story we see around us today, the story of betrayal, even of Christian by Christians. That St. Joan puts her mysterious life before us as a symbol of hope, is something I would want to share with all the youth in Ireland, under the age of thirty. Without hope, there is no springtime of youth. Above is a photo of the young St. Therese, Doctor of the Church, in a drama, as St. Joan of Arc. Also, there is the famous statue of St. Joan. The two women, both young, could not be more different. That this gentle and increasingly ill little nun, whose writings have changed the world, looked to a militant woman, who led one of the greatest armies of the world at her time, is an amazing thought. We need heroes. We need role models. We need greatest shown to us in order to make the best decisions. I pray that parents and educators everywhere inspire youth with such models.